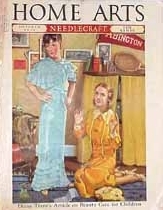 I was able to verify that this was used as a cover for Home Arts Needlecraft Magazine in October 1936 and the artist is Ralph Pallen Coleman. Take a close look at the picture. 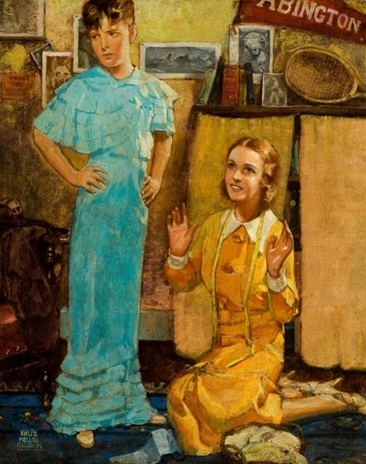 It's obviously a mother with a boy in a dress. Further evidence is in the background, which is undoubtedly a boy's room. Not much else was I able to verify other than the lead article discussed "Diana Trent's Article on Beauty Care for Children". I am not sure that applied to boys also? Anyone have a copy? I vaguely remember a similar incident in my life. My mother need to hem a dress and I was the dress form. I believe she wanted it to be even along the bottom. In my case I don't think I would have been so unhappy. Sorry I wish I remembered more. How about you? Anything similar? Yes both my Grand mothers were big sewers, one made half her living from dress making. I became the dress form. Our town had its 100 year celebration, and the 1890s was the popular costume for the several dress up costume parties, balls in 1957, I loved the bell lamb chop.selves and the undies that I was made to wear for the fittings! If so.e if the ladies knew how their nice fit was done they would have gone up like Shepard and Glenn in the following years! To Yoda It, I love it I did!